E.T., the phone line is open and SETI is waiting for your call. And apparently Jodie Foster, too. The institute reached its goal last week of raising $200,000 to operate the telescope through the end of this year. The funds came from over 2,000 private donors, including the actress Jodie Foster, who played fictional SETI scientist Ellie Arroway in the 1997 movie "Contact." 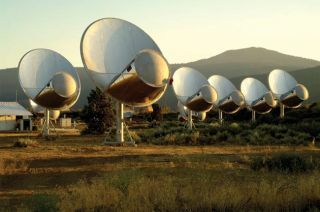 The Allen Telescope Array is SETI's collection of 42 radio dishes, each 20 feet (6 meters) wide, at Hat Creek Radio Observatory in Northern California. The dishes work together to scan the heavens for signs of an intelligent civilization out there in the cosmos creating non-random signals. The instrument, named after Microsoft co-founder Paul Allen, who funded its construction, is the first to be dedicated almost entirely to the search for extraterrestrial intelligence. "Its main advantage is that we can use it 24/7," said SETI senior astronomer Seth Shostak. "In principle it's always available to us. When you're using someone else's antenna you get a certain amount of time on the instrument. That makes for very inefficient observing. I liken it to borrowing a microscope to do cancer research." Shostak said it was encouraging to learn just how much people care about the quest to find life in the universe. "For me it's the general public — the fact that people are willing to reach into their wallets to pay for a voyage of exploration that might or might not succeed," Shostak told SPACE.com. "SETI, despite the fact that it's an uncertain bit of exploration with no guarantee of success, people find it interesting." Other contributors to the SETIStars fund include science fiction writer Larry Niven and Apollo 8 astronaut Bill Anders, who wrote: "It is absolutely irresponsible of the human race not to be searching for evidence of extraterrestrial intelligence."